GLAS opens 2014 with a superb piece from the Fishamble Theatre Company in Dublin. 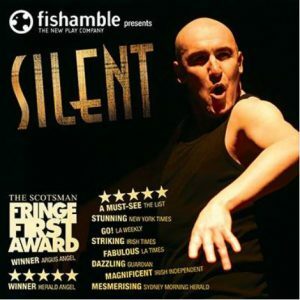 Silent has received great reviews from the likes of Ben Brantley, the New York Times (passionate…stunning), the Guardian (dazzling), the Irish Times (a striking performance), Sydney Morning Herald (mesmerizing)… Need I go on? You can reserve through bookings@theglas.org for 19.30 on Jan 30 in the Aula, College des Coudriers (opp Balexert). Main beneficary is the Edith Wilkins Foundation for Street Children in Darjeeling. Thanks again to Shire AG and Charlie O’Neill’s for sponsorship and The Geneva Irish Association for the usual support. It will be special!